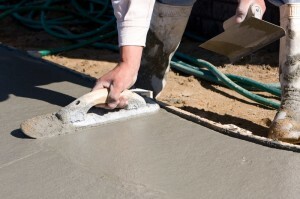 No matter how much care you take with your concrete driveway it will eventually start to wear. 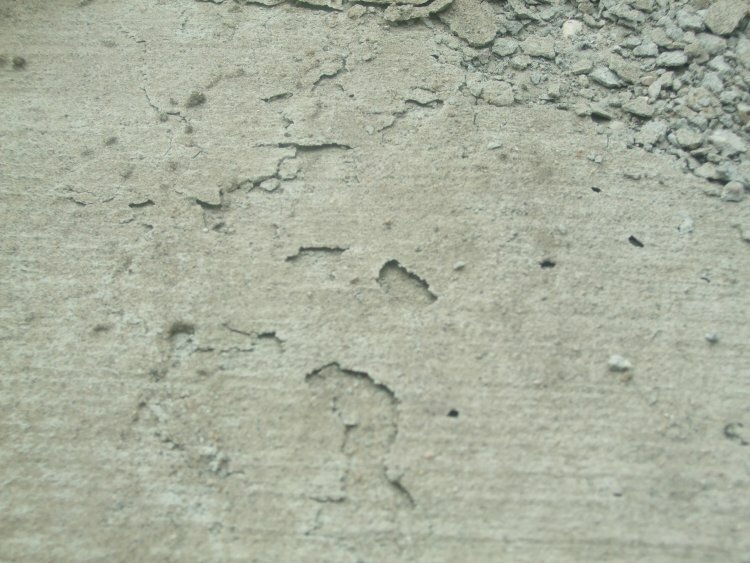 If your home was built in the last fifty years your driveway, and probably your walkway, are built with concrete. 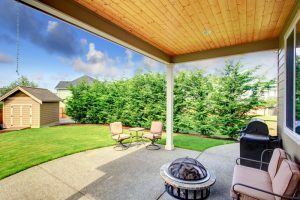 These outdoor features of your home need to be made of materials that are durable and long lasting, and concrete fits the bill. What do you do when signs of aging start to appear? Whether it’s pitting due to oil or other petroleum products leaking from vehicles onto the surface, or from shifting soil that leaves cracks in the cement where grass and weeds can grow, your driveway can become an ugly welcome home. 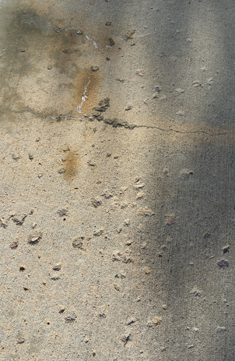 If your driveway is looking like it may need to be jack-hammered out and re-poured that can be a big expense. 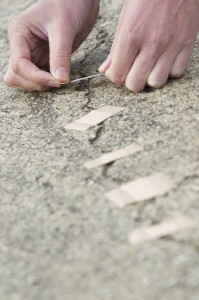 Here’s the good news, don’t just put a bandage on it, there is another solution. 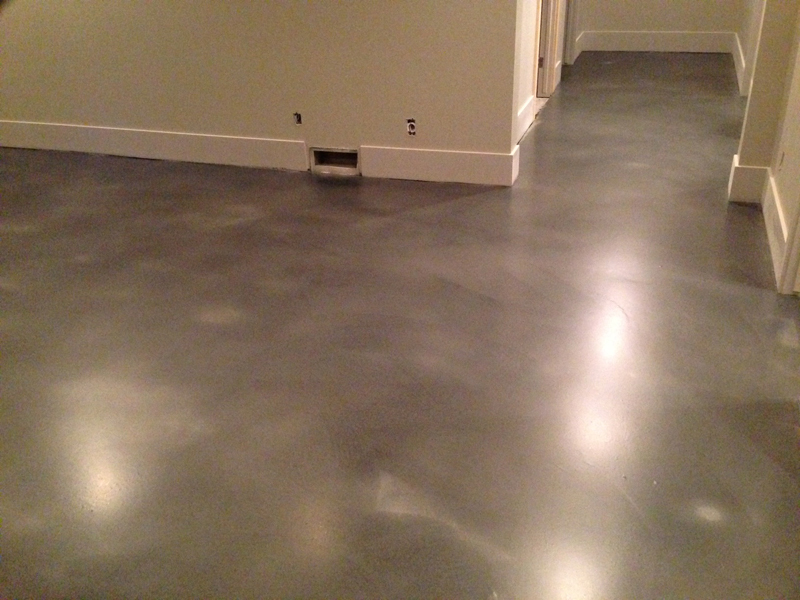 Concrete resurfacing is a way to bring those aging concrete walks and drives back to life. Just like the interior floors in your home concrete patios can have as many different looks and finishes. Colored Concrete can add beauty and design to your concrete. There are now so many different colored finishes that you would need to use a color chart to decide which would be appropriate for your décor. 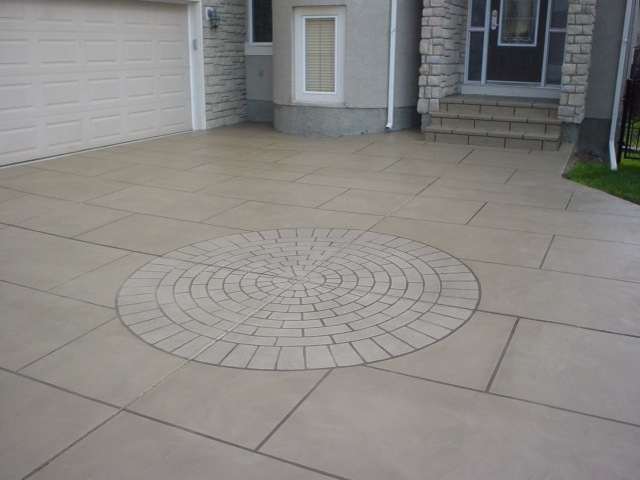 Stamped Concrete can have the look and feel of any stone or brick surface you can imagine. Everything from stone pavers to naturally worn stone pavers. A great option for any back yard concrete patio. Stenciled or Logoed concrete can leave a look of an open area rug or your corporate logo to enhance the look of your concrete surface. A great conversation starter. Exposed Aggregate along with smooth concrete sections is a beautiful option for the new patio and can be manipulated for any design requirement. 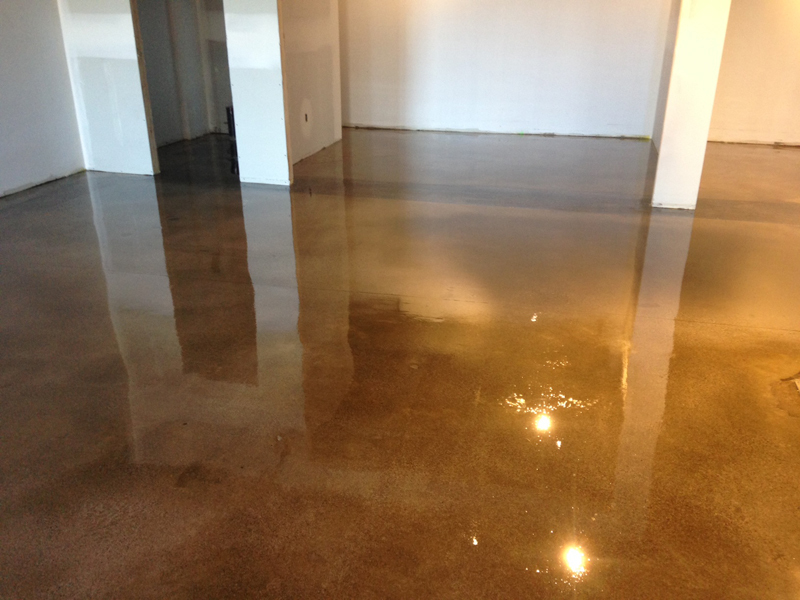 Stained Concrete can add a durable and beautiful color to your patio with thousands of colors and finishes. These are a few options for that new patio and there are many more. Give us a call to find out if one of these is right for your project. 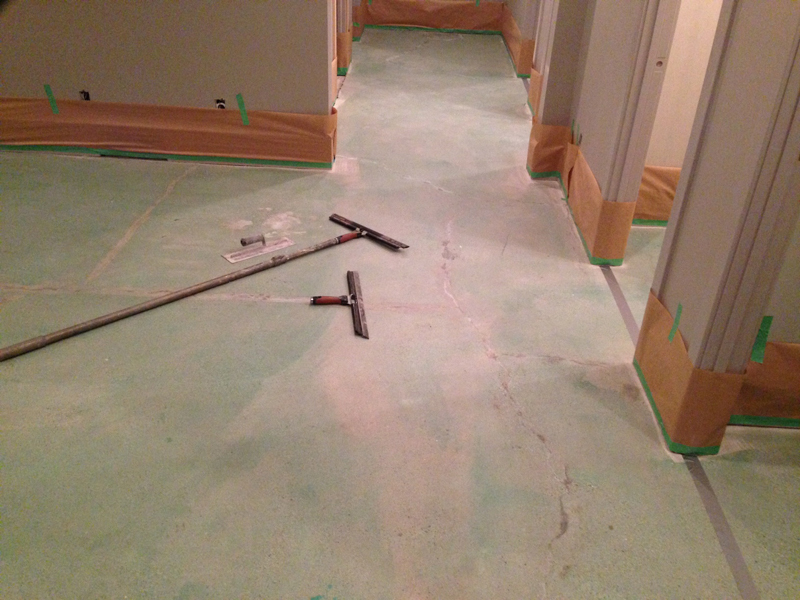 Remember a couple of weeks ago we asked you to stay tuned for updates on the wine store floor project. After Hardscapes Inc. gave it a diamond grind, some patching, and an Elite Crete pt1 epoxy application the old used up floor have found new life. Who would have guessed that this was the same floor. Adding too much water weakens your concrete. 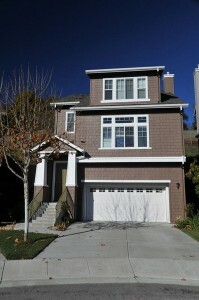 When that happens your aggregate or rock that is in the concrete begins to sink lower in the poured area. That leaves the lighter weight cement and sand at the top. 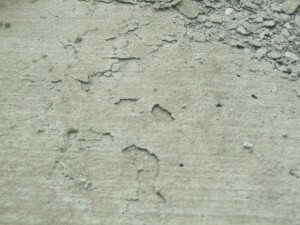 This can lead to very quick pitting and damage to your poured area especially things like concrete driveways. 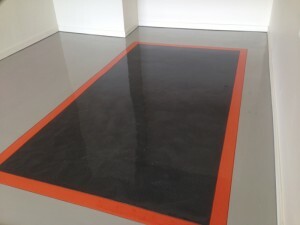 Today there are is a great number of additives you can use to improve the strength of your concrete. Plastisizers, hardeners, helps it set quicker, fiberglass strands which add strength. 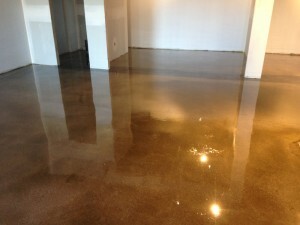 Hardscapes Inc. has all the answers to the question of how to create great solid concrete. Why not give us a call. 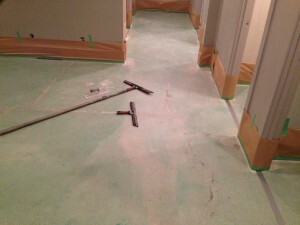 Custom flooring is one of Hardscapes Inc’s specialties! We just completed this little project for Calbridge Homes new sales center in Mahogany. It was done in their company colours with reflector/enhancer for the dark center and a custom orange to mimic their logo. We have done many floors tailored to clients specific needs. 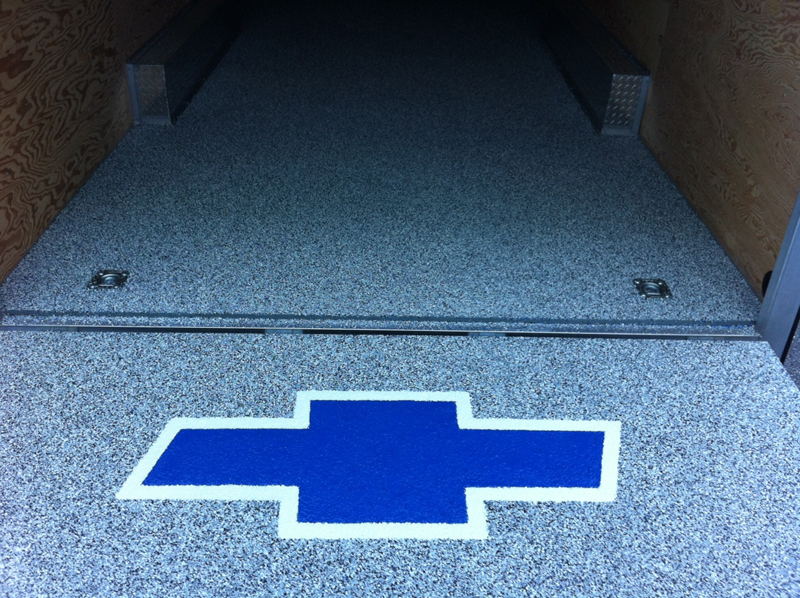 Make your floor your own with corporate logos, company colours, or your favorite team or car logo, like the one below we installed in a show car trailer. 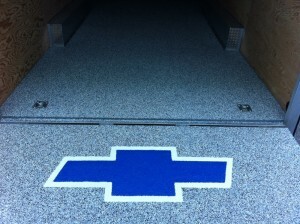 Hardscaped Inc. can configure any concrete or cement surface to meet your commercial or domestic needs. 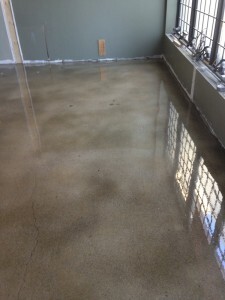 One way of solving this problem is called mud jacking, a process that pumps high pressured grout into the void under the driveway through holes cut in the surface. The process fills the space between the foundation element and the eroding soil. Hardscapes Inc. has a number of solutions to repair and rebuild the surface of your concrete drive and bring it back to its previous beauty. Give us a call to find the solution right for you.